When i send AJAX request, the parameters are not listed in network monitor. I use latest Developer edition in Ubuntu MATE 14.04. I can confirm this is also happening in Nightly, and has been for weeks. This makes debugging asynchronous requests next to impossible. This is fairly critical functionality. I've had to fire up Chrome to get my work done, unfortunately. I can reproduce using the testcase from comment 2 (thanks Dane !). ntim │ danemacmillan: what's strange is that requests that happened *before* the netmonitor was opened show "No parameters for this request"
ntim │  danemacmillan: do you know if this is only a recent issue ? danemacmillan │ around. This one has been lingering a while longer than usual, though. danemacmillan │ I can't be more precise than that. I just know I've been complaining about it with some colleagues of late. danemacmillan │ Oh no--it has absolutely worked in the past. I'm not sure what use case the `onlyEnumVisible: true,` argument fixes here, really. Or maybe we want to have onlyEnumVisible for JSON only, I don't know. Probably copy pasta leftover. It makes sense for the json because you don't want __protos__ there, but here it's rather irrelevant. 2. we should have some sort of test so we don't regress in the future? Has the patch been applied to dev edition, or still not? Because it is still the same. > Has the patch been applied to dev edition, or still not? > Because it is still the same. It's not even in Nightly yet. Attachment #8701811 - Flags: approval-mozilla-aurora? Thanks--this is working in Nightly! Still not in dev edition though. > Still not in dev edition though. Should be there in a week or so. Depends on when the approval request in comment 18 gets accepted. I've just updated dev edition, the parameters still don't show up. Yes, the patch landed 6 minutes ago. It should be in tomorrow aurora build (or the day after). on Linux, 64 Bit with the instructions from comment 3.
windows 8.1, 64-bit with the instructions from comment 3. As this bug is also verified on Linux(Comment 28),I am marking this as verified! I have observed similar to this bug on Firefox Developer edition 51.0a2 (2016-11-05) (64-bit) on Ubuntu 14.04 LTS. Ajax requests from a "https" page to "http" page are failing even after allowing the mixed content in about:config, and these failed requests are not being shown up in the network monitor. v51.0.1: shows JSON expanded line only... but show details after click UNDER JSON line. v53.0a2: does not show anything at all... so parameters tab simply does not work. How to switch it to NOT FIXED? I can't reproduce using the steps from comment 3. I'm not noticing any difference in any of the panels (except for the styling). I've attached a screenshot. Do you have a specific webpage where this doesn't work? Can you attach a screenshot ? In developer edition "JSON" word is absent and whole right panel is blank. Honza, Ricky, Jarda, might be a regression from the netmonitor html changes ? Maxim, could you reproduce this issue on latest Nightly? The Params Panel UI looks like the old XUL implementation in comment 33. Do you come across the same problem in Nightly? > Maxim, could you reproduce this issue on latest Nightly? > you come across the same problem in Nightly? comment 33 says that in developer edition (which has the new implementation), the whole params panel is blank. Yes developer version has it blank. But nightly 54.0a1 (2017-02-06) (64-bit) works fine! P.S. How to attach image directly in comment? Maxim, you can upload image by clicking "attach file" in bugzilla. Images in comment 33 looks like old XUL implementation for me. So I guess the issue has been fixed in latest build but hasn't arrived in developer edition. ntim, does it makes sense to you? > Maxim, you can upload image by clicking "attach file" in bugzilla. > ntim, does it makes sense to you? My understanding of comment 33 is that the screenshots (partly working params panel) are from Firefox 51 (old version), and that developer edition has a blank params panel. So we should uplift whatever patch that isn't on developer edition, but is on Nightly. The issue happens in old XUL implement (developer edition) but it has been fixed in Nightly (confirmed on comment 37). I prefer not to fix this issue by uplifting because if we uplift one or two patches to fix the main issue would introduce UI inconsistency in other panels. That means we would introduce a new TreeView style ParamsPanel which built with react, but the rest of the panels would remain unchanged. As a result, I'd not prefer to uplift a series of patches for all panels due to high risk. > fixed in Nightly (confirmed on comment 37). Agreed, seems to risky - we should just let this ride the trains. How about making a specific patch for devedition ? Seems like a good compromise if we don't want to uplift all the dependencies. Does anybody know, when the bug get fixed? Can we make a special patch for Developer Edition and simply uplift that one? I tested dev edition 53a2 (2/14) on windows and JSON params shows correctly. So it's fine for Developer Edition. 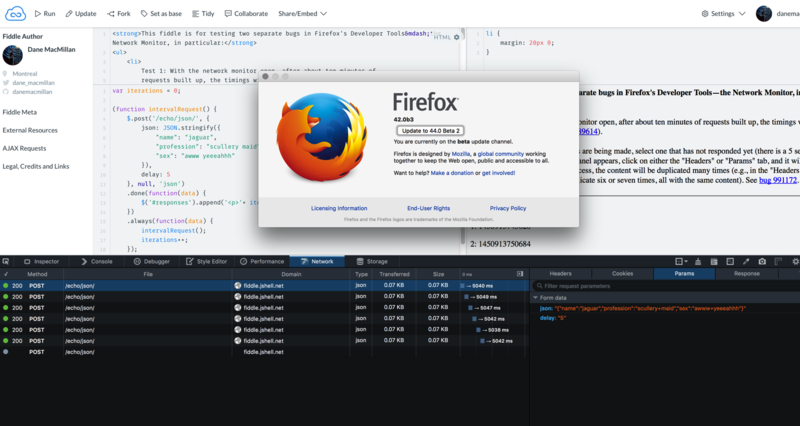 The report from comment 30 is 3 months ago (Firefox Developer edition was v51), but now the release train has arrived to v51 and the issue already fixed current Firefox Developer edition (v53). As a result, the issue has fixed in aurora and nightly but still remain in beta and release. I'd prefer to ride the trains since the issue seems not that critical to affect beta / release users, neither needs to uplift a hotfix for beta or release IMO.